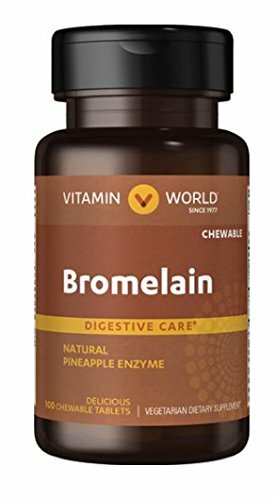 DESCRIPTION Derived from the stems of pineapple, Bromelain is a natural digestive enzyme derived from the stems of pineapple. ** As a natural enzyme, Bromelain helps digest protein in the gastrointestinal tract. ** In general, enzymes break down the nutritional components of proteins, fats and carbohydrates, making these nutrients available for the body's energy needs, cell growth and other vital functions. ** Gluten Free Vege LABEL INFORMATION Supplement Facts Serving Size 2 Tablets Servings Per Container 50 Amount Per Serving / Percent Daily Value Calories 5 Total Carbohydrate1 g <1%** (Sugars 1 g *** Enzyme Blend 100 mg *** Pineapple Bromelain80 mg *** Papain20 mg *** **Percent Daily Values are based on a 2,000 calorie diet. ***Daily Value not established. Directions: For adults, chew one (1) or two (2) tablets with each meal. Other Ingredients: Sugar, Dextrose, Natural Flavor. Contains <2% of: Silica, Vegetable Magnesium Stearate, Vegetable Stearic Acid. Warning: If you are pregnant, nursing, taking any medications or have any medical condition, consult your doctor before use. Discontinue use and consult your doctor if any adverse reactions occur. Keep out of reach of children. Store at room temperature. Do not use if seal under cap is broken or missing.